Organisms are adapted to live in particular environmental conditions. Polar bears (Ursus maritimus) need to walk across sea ice to hunt; and corals need water that is warm, with just the right salinity. When condi--tions change, organisms need to change, or they may die out locally or even go extinct. Scientists who study the effects of global warming on the biosphere have discovered that the processes of evolution do not work fast enough for organisms to adapt to rapidly changing climate. At most, species may evolve a greater ability to disperse into new geographic locations. For example, two species of bush crickets in the United Kingdom evolved longer wings in their northern range boundary. The longer wings allowed the crickets to travel to new territory farther north. The most common response, then, that a species has to warmer temperatures is to move to a cooler location, either higher latitudes or higher elevations. The fossil record indicates that changing latitude or altitude was a common response of organisms to climate change in the past. Of course, this strategy does not always work because the environment in the direction the organisms move may turn out to be unsuitable. Land-based species could find their way to favorable conditions blocked by an impassable ocean or extended out of reach beyond the top of a mountain. The situation is now more complicated than it was in prior Earth history because people have altered the environment with farms, ranches, and cities that may be incompatible with the species' needs. A species also may respond to climate change by altering the timing of phases of its life cycle, so that it breeds earlier in the spring, for example. This does not necessarily help it better adapt to the new circumstances; it only reflects the way the species is evolutionarily programmed to respond to weather cues: to breed when the nighttime low temperature rises above freezing for several days in a row, for example. The science of how climate influences the recurrence of annual events in the life cycles of plants and animals is called phenology. Some of the findings of phenology as they concern global warming are discussed below. Increased temperatures have brought conflicting changes to the aquatic life in some lakes. For example, with a longer growing season and less ice cover, a lake may have more algal growth and therefore higher primary productivity. (Algae are a very diverse group of organisms they are not plants, but most algae photosynthesize.) However, the warm water may remain at the surface, so that there is less mixing of nutrients, which may cause a decrease in productivity. Warming temperatures have changed the phenology of some freshwater species. In large lakes, the phytoplankton population explodes in the spring, after mixing brings nutrients from deep water to the surface, and when the springtime sunlight becomes strong enough to support photosynthesis. To take advantage of the abundant food, zooplankton populations mushroom just after the spring phytoplankton bloom begins. Now, with spring arriving earlier than in the past, the phytoplankton bloom occurs up to four weeks earlier, but the zooplankton bloom has not kept up. By the time the zooplankton emerge, the phytoplankton populations have already peaked, and the zooplankton starve. Because zooplankton are food for the small fish that serve as food for larger fish, a loss of zooplankton can cause a collapse of the local food web. However, in some lakes, zooplankton populations have increased, and fish populations have grown. Some species of fish, both wild and farmed, have also changed their spring life cycle patterns. Warming temperatures in rivers have affected the abundance, distribution, and migration patterns of some fish species. In some rivers, warm water species are replacing cold water species. Migrations may take place up to six weeks earlier in some fish populations. Populations that experience such a large change in timing typically suffer higher mortality rates in fish and their spawn. In marine organisms, variations in abundance, productivity, and phenology are strongly influenced by short-term climatic variations, such as the El Nino-Southern Oscillation (ENSO) and the North Atlantic Oscillation (NAO). Separating these influences from those due to greenhouse warming is sometimes difficult. Nevertheless, scientists say that several effects are largely due to global warming. NASA estimates that global plankton productivity has decreased at least 6% to 9% in the past 25 years due to rising SST. Warmer temperatures are also causing marine plankton and fish to move toward the poles. One large, recent study found that North Atlantic species moved northward by 10° latitude in 40 years. While overfishing is the cause of the collapse of the once copious North Atlantic cod (Gadus sp.) population, warming temperatures may be working against the species' recovery. Recent declines in plankton numbers may be a factor in the poor survival rates of cod larvae. The warming of the air over the Antarctic Peninsula by 4.5°F (2.5°C) in the past 50 years has greatly affected life in the Southern Ocean. Krill (Euphausia superba), an extremely abundant type of zooplankton, form the base of the Southern Ocean food web and are the favorite food of some whales. Since 1976, warming temperatures have reduced the extent of sea ice, which has reduced the habitat required for the ice algae that are a favorite food of the krill. This has been one factor in the 80% decline of krill in the southwestern Atlantic, where they have been historically concentrated. The decrease in krill numbers has opened up the seas for an increase in salps. These jellylike organisms are not a good source of food for fish and other organisms higher up the food web. As a result, populations of seabirds and seals are in decline. Many marine plankton species have advanced the timing of their seasonal behavior. Just as in large lakes, when the zooplankton no longer emerge in time to take advantage of the phytoplankton bloom, the zooplankton population suffers. The loss of zooplankton for the food web has negatively affected populations of fish, seabirds, and marine mammals. The migrations of some species of marine animals are also changing; migrations have been found to occur one to two months earlier in warm years. Nearshore organisms are also showing the effects of warming. In the Pacific, the species found in the intertidal, kelp forest, and offshore zooplankton communities are shifting their ranges due to warmer temperatures. Sea anemones, for example, are moving into California's Monterey Bay, where the water was previously too cool. The richest ecosystems in the oceans, coral reefs, are being damaged by rising ocean temperatures. Scientists at Oregon State University are blaming warming temperatures for a dead zone that has formed in coastal waters off the state. As of 2006, the dead zone was 1,234 square miles (1985 sq. km), about the size of Rhode Island. In that year, it made its first appearance in the coastal region of Washington State. 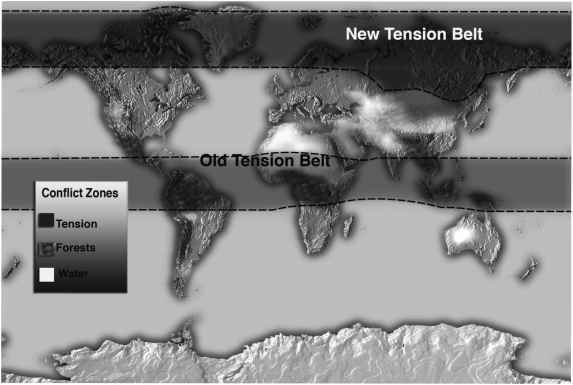 The dead zone recurred in 2007 but was not as large or intense as the 2006 event. A survey by scientists using a remotely operated underwater vehicle found rotting Dungeness crabs (Cancer magister) and sea worms, and a complete lack of fish in the area. "Thousands and thousands of dead crabs and molts were littering the ocean floor, many sea stars were dead, and the fish have either left the area or have died and been washed away," Professor Jane Lubchenko, who was involved in the study, said in a 2006 press release from Oregon State University. Oceanic dead zones are caused by extremely low levels of oxygen in a region's waters. Without oxygen, most marine organisms suffocate. The Oregon dead zone is different from most dead zones, including the much larger one in the Gulf of Mexico. In the gulf, Mississippi River waters carry loads of excess nutrients from fertilizers, detergents, and runoff from feedlots into the water, causing an algae bloom. When these algae die, they are decomposed by bacteria and other organisms that use up all the water's oxygen. In the Oregon dead zone, warmer air has changed ocean circulation. In normal years, southerly winds push surface water toward the shore, which keeps deep, nutrient-rich, oxygen-poor waters down below. These southerly winds alternate with northerly winds that then push the surface water out to sea. This brings the nutrient-rich, oxygen-poor water to the surface and allows it to mix with the normal surface nutrient-poor, oxygen-rich waters, providing an ideal environment for phytoplankton to bloom (but not overbloom) and support a healthy food web and marine fishery. In dead zone years, all the winds come from the north, and the nutrient-rich, oxygen-poor waters rise to the surface. Plankton bloom and feed off the nutrients, but when they die, they are decomposed by bacteria that take in the oxygen that remains in the water. As a result, oxygen levels dip as low as 10 to 30 times below normal: In one location, they were near zero. Although they are far from certain, scientists say that changes in the jet stream due to global warming is the likeliest explanation. Coral reefs are known as the "rain forests of the sea" because they harbor such an incredible abundance and diversity of life. These spectacular and beautiful ecosystems are home to more than one-fourth of all marine plant and animal species. Reefs are built of tiny coral animals called polyps that construct calcium carbonate (CaCO3) shells around their bodies. When the larva from a young coral polyp attaches itself to a good spot, usually on an existing coral, and builds a shell, the reef grows. The coral polyps enjoy a mutually beneficial relationship with minute algae called zoo-xanthellae. In this relationship, the photo-synthetic algae supply oxygen and food to the corals, and the corals provide a home and nutrients (their wastes) for the zoo-xanthellae. The algae give the coral their bright colors of pink, yellow, blue, purple, and green. Coral polyps sometimes feed by capturing and eating the plankton that drift into their tentacles. Corals can thrive only in a narrow set of conditions. They are very temperature sensitive, so the water must be warm, but not too hot. Water depth must be fairly shallow, with moderately high but constant salinity. The zooxanthellae must have clear, well-lit water to photosynthe-size. Coral reefs protect shorelines from erosion and provide breeding, feeding, and nursery areas for commercially valuable fish and shellfish. 4.9 days per decade. Longer growing seasons and warmer temperatures are sometimes accompanied by higher productivity, range changes, and earlier spring and summer seasonal events. The total effect of growing season length on productivity is unclear. Satellite data show that a lengthened growing season caused increased productivity in the Northern Hemisphere from 1982 to 1991. However, from 1991 to 2002, productivity decreased there, possibly due to hotter, drier summers and more widespread droughts. one bleaching event, but multiple events can kill them. 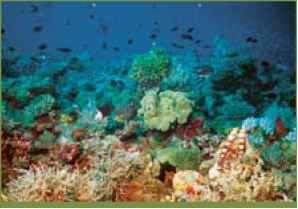 Disease in corals and some other reef organisms has increased, especially in reefs that are already stressed. Dr. Clive Wilkinson, coordinator of the Global Coral Reef Monitoring Network, blames the current upsurge in coral bleaching on rising seawater temperatures due to global warming. An increase in summer maximum temperatures of 1.8°F (i°C) for two to three days can trigger a coral bleaching event. If the elevated temperatures persist for less than one month, the reef will likely recover, but sustained heat will cause irreversible damage. After some high-temperature episodes, the resident zooxanthellae have been replaced by a more heat-tolerant species, and so the reef survives. However, many reefs are already found in the warmest water that zooxanthellae can tolerate, so this process is unlikely to save many reefs in the long run. According to Wilkinson's report, Status of Coral Reefs of the World: 2004, 20% of coral reefs are severely damaged and unlikely to recover, and another 24% are at imminent risk of collapse. A wide variety of plants and animals have undergone recent range changes due to rising temperatures. An analysis of more than 1,700 species by Camille Parmesan of the University of Texas, Austin, and Gary Yohe of the University of Middletown, Connecticut, published in Nature in 2003, concluded that there has been a northward range shift of 3.8 miles (6.1 km) per decade. In tundra communities, a shift toward the poles or up mountains may result in a small decrease in range or replacement by trees and small shrubs. North American animals with ranges that are shifting northward include pikas (Ochotona sp. ), Rufous hummingbirds (Selasphorus rufus), sea stars (of the class Asteroidea), and red foxes (Vulpes vulpes). Species of plants and animals that have never before been seen in the Arctic are moving in, such as mosquitoes and the American robin (Turdus migratorius). Antarctic plants have increased in abundance and range in the past few decades. Species are disappearing in the lower latitude portions of their ranges. In North America, the Edith's checkerspot butterfly (Euphy-dryas editha) is almost extinct in Mexico but thriving in Canada. Ade-lie penguins are now thriving at their southernmost locations but have experienced large population declines where they are found farthest north on the Antarctic Peninsula. Organisms are also moving up in altitude. Besides contracting in the southern end of their range, many more populations of Edith's checkerspot butterfly are becoming extinct in the lower elevation portions of their range (40%) than in the highest portions of their range (less than 15%). As a result, the mean elevation of the butterfly has moved upwards by 344 feet (105 m). In the Great Basin of the United States, the lower elevation populations of pika (Ochotona princeps) that were documented in the 1930s were extinct by the early 2000s because the animals have been found to die when the temperature reaches 88°F (31°C) for more than one-half hour. In the Alps, native plant species have been driven off mountaintops as they search for favorable conditions and as nonnative plant species move uphill. wintered in Africa are now migrating west to Great Britain. Chiff-chaffs (Phylloscopus collybita) no longer migrate south, but remain in the United Kingdom for the winter. 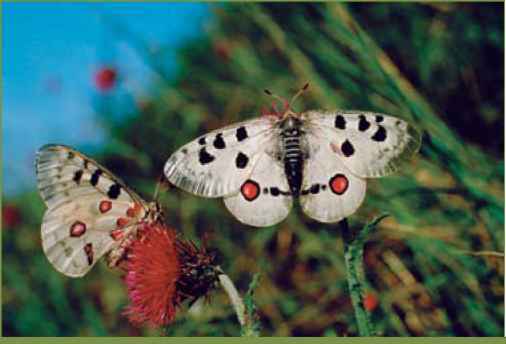 Of the 57 species of European butterflies Parmesan studied, the ranges of 35 of them were migrating northward: For example, the Apollo (Parnassius apollo), moved 125 miles in 20 years. The Purple Emperor (Apatura iris), unknown in Sweden until the early 1990s, has been increasing its population there. African species, such as the Plain Tiger (Danaus chrysippus), have moved into Spain. Yoye detected an advancement of spring events of 2.3 days per decade averaged for all species and 5.1 days per decade averaged only for species that showed a change. These changes have been seen in plants, such as lupines (Lupinus sp. ); insects, such as crickets and aphids; amphibians; and birds. For example, frogs in eastern North America and in England have been found to breed weeks earlier than they did early in the twentieth century. In mammals, high latitude and altitude species show the most changes. For example, yellow-bellied marmots (Marmota flaviventris) in the Rocky Mountains emerged from their winter hibernation 23 days earlier from 1975 to 1999. Phenology is relatively easy to study in birds because the animals are visible, and their life cycles are highly regulated by seasonal changes. In many species, temperatures and conditions on the wintering grounds determine spring migration dates. British observers have noted that migratory birds now arrive in their breeding grounds 2 to 3 weeks earlier than they did 30 years ago. The egg-laying dates of these birds have also advanced—an average of 8.8 days for 20 species between 1971 and 1995. In some European flycatchers, the egg-laying dates match trends in local temperature. For each 3.6°F (2°C) rise in temperature, the birds lay their eggs two days earlier. Unfortunately, the life cycles of the plants and invertebrates that these birds rely on for food have advanced even more, by about six days for each 3.6°F (2°C) rise in temperature. This timing discrepancy may, at some point, cause problems for the birds because their young will hatch well after their food sources peak. Already in some species, such as pied flycatchers (Ficedula hypoleuca), the number of young birds that hatch each year is smaller. In some vulnerable locations, changing temperatures have led to the loss of suitable habitats, which is having a dramatic impact on some species. (A habitat is the natural environment of an organism, including the climate, resource availability, feeding interactions, and other features.) The loss of arctic sea ice, for example, is destroying the habitat that is needed by polar bears and northern seals. In the southern edge of their range, where ice is melting and hunting time is reduced, polar bear populations are in significant declines, and their mean body weight is decreasing. In addition, warmer temperatures have caused the populations of ringed seals, the bears' main food, to decline. In the northern portions of their range, significant numbers of polar bears have drowned because they are unable to swim the greater distances between ice floes. These more northerly polar bears are also experiencing lower reproductive success and lower body weight. How climate change affects plant and animal phenology?